Anyone who’s ever undertaken a home-improvement project knows the first step to a job done right is having the correct tools. Samaritan’s Purse now has those tools in place in Eldoret, Kenya. 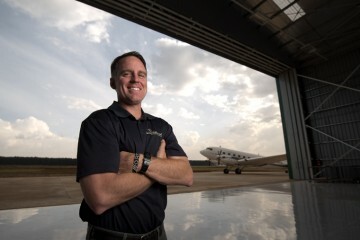 A new 15,600-square-foot hangar was completed last October and dedicated in March. The new facility houses three aircraft critical to our programs across East and Central Africa, and will allow us to continue our extensive efforts across the region and also expand operations. MAS East Africa staff work hard to maintain our aircraft and keep them flying to deliver relief across the region. MAS East Africa moved to Eldoret in late 2012. 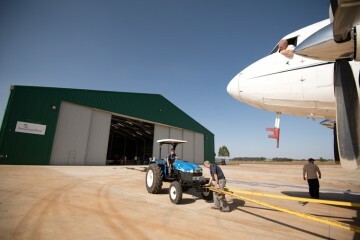 Construction began on the hangar in October 2013, and the team moved into the new home in October 2014. The facility was built on schedule and on budget using Kenyan construction companies and Kenyan labor. In addition to providing needed office and storage space, the hangar increases maintenance efficiency, as staff members no longer have to battle with strong winds and heavy downpours. “After over two years of doing all our maintenance out on the flight line, just to have a facility like this, it’s truly special,” said Drew Fitzpatrick, Program Director for MAS East Africa. Samaritan’s Purse aircraft based in Eldoret provide support to our work in Kenya, Uganda, South Sudan, the Democratic Republic of Congo, and other countries. They were instrumental in our response to the Ebola crisis in Liberia. The three planes—a DC-3TP, a King Air B200, and a Cessna 208B Grand Caravan—transported nearly 1.8 millions tons of cargo in 2014 and average about 200 hours of flight time each month. A second Caravan will be added to the fleet later this spring. 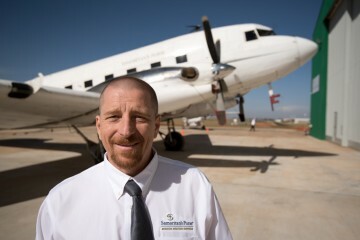 Brian Stoltzfuz, Director of Operations, grew up working on old planes, similar to our workhorse DC-3 built in 1945. The vast majority of our East Africa flights go across and into South Sudan, where we serve the water/sanitation, nutrition, medical, and spiritual needs of tens of thousands of refugees and displaced persons. Roads into the areas where we work, if they exist at all, are rough to say the least during the dry season and impassable during the rainy season. In addition, significant security concerns—related to a bloody civil conflict—make some roads unsafe at any time. That’s why aviation is so important to our mission. In Maban County, South Sudan, Samaritan’s Purse operates the only functioning surgical hospital in Upper Nile State. When seven tons of floor tile and an X-ray machine needed to be transported there, roads were not an option. Aircraft also give our staff members a little extra peace of mind as they serve in remote and often dangerous locations. “Having the airplanes available is a huge deal, a huge morale booster, to our people in Yida and Maban and those places,” Stoltzfus said. Our Eldoret staff is a mix of Kenyan nationals and expatriates; men and women who serve as pilots, mechanics, line crew, office workers, and directors. The group is committed to shining the light of the Gospel of Jesus Christ throughout the region. “I love this place not because of the building but because of the people and what we do,” Matt Olson said. Kenyan pilot Amos Simiyu flies the Caravan into South Sudan to deliver needed supplies. Amos Simiyu, a Kenyan pilot born about two hours drive from Eldoret, wanted to fly ever since his Air Force cousin let him climb into the cockpit of a military plane at age 8. But the armed forces were never an option for him. Instead he wanted to do the kind of aid work he now does. He still remembers one of his first chances to speak to a Muslim man in Sudan several years ago. Shaun Rix, an American citizen who was born in Zimbabwe, grew up in Australia, and lived in Canada, is another Samaritan’s Purse pilot based in Eldoret. Flying airplanes is an inherently stressful, life-and-death profession—especially when flying to destinations with armed conflict. It’s easy to understand why he views his job as a divine calling. “If I didn’t firmly believe that I was doing God’s will, doing what God called me to do, I wouldn’t be here,” he said. His roster of cargo shows just how valuable the work of MAS is in East and Central Africa. “Everything from cement to carrots, bags and bags of cement, building supplies, window frames, water pumps, solar panels and equipment to set all that up, motorbikes, quads, truck parts, truck tires, a lot of food supplies,” he said. Wilfred Ojwang, a native Kenyan, has worked his way up from the line crew to the role of mechanic. Amos, Shaun, and Wilfred are just a few of the two dozen MAS staff in Eldoret, each with an important role to play. 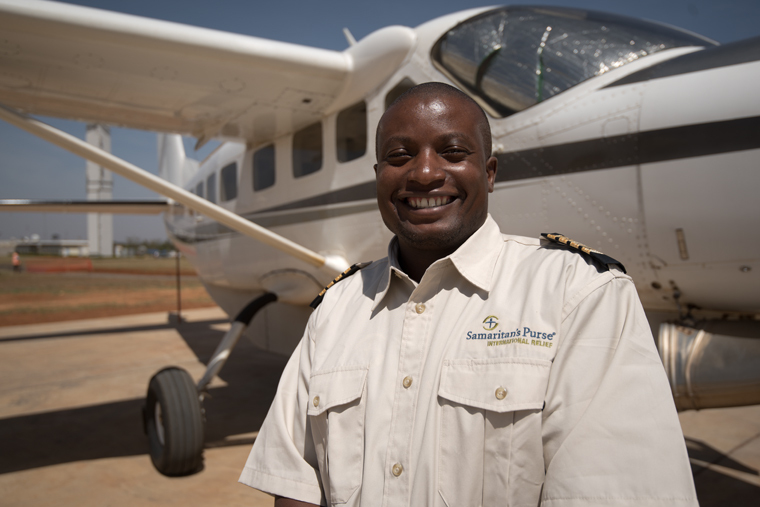 As Samaritan’s Purse now expands its efforts to meet the enormous needs of this region and beyond, the entire mission aviation staff in Kenya is eager to play a key role in extending the Gospel to some of the world’s toughest places, where there are no roads. “That Your way may be known on earth, Your salvation among all nations” (Psalm 67:2, NKJV). Please pray for our aviation staff and their families living in Kenya and for the safety of our teams as they travel by air.